More and more persons care so much about body contour especially regarding the abdominal wall. For that reason abdominoplasty is a frequent operation for correction of physical abnormalities concerning very much on patients and surgeons. Both must have a precise idea of what can be accomplished by the procedure and try to achieve the best surgical results. This subject seldom was discussed in our congresses since there were no new topics to be presented until 1999 when I introduced new concepts on abdominoplasty. The new surgical principles were employed for treatment of some deformities on superior regions of the abdomen which were not previously described. 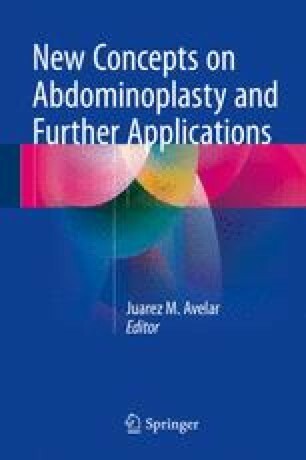 The main purpose of this Chapter is to present a new approach for abdominoplasty through which the aesthetic operation may treat simultaneously the upper and lower segments of the abdominal wall without transposition of the umbilicus. Selection of patients and surgical planning for a combined approach on the abdominal wall are based on careful evaluation of each patient. The main anatomical point of reference for indication of the surgery is the high implantation of the umbilicus since the vertical distance from the umbilicus to the pubis is very long. Surgical evaluation is the key to select patients for this operation. Upper and lower abdominoplasty is a combination of each procedure on both regions that show local abnormalities, which may be treated separately. Surgical demarcation is done 1 day prior to the surgery with the patient in standing position in front of some mirrors. The areas for skin resection are marked on the suprapubic region inferiorly, and on the superior abdomen, two half-moon-shaped areas are drawn below the submammary fold bilaterally. Also, the areas for liposuction are marked all over the abdomen wall. The operation is performed at the hospital following all steps concerning the routine procedures under general anesthesia combined with local infiltration. Two levels of local infiltration must be done: a deep one on the supramuscular on all regions for liposuction and superficial infiltration on areas for skin resection. Liposuction is performed on two types: on full thickness of the panniculus where skin resection will be performed and on deep level all over presenting localized adiposities following previous demarcation. Afterward, deep liposuction is done on all regions of the abdominal wall presenting localized adiposities where skin resection will not be performed. On the next step, skin resection is done on the areas of liposuction performed on full thickness of the panniculus. It is important to emphasize that the remaining panniculus slides easily over the musculo-aponeurotic wall because there is no fat below the fascia superficialis, and all perforator vessels were preserved which work as multiple pedicles to the abdominal panniculus. Although the abdominal panniculus is not undermined, but plication of the musculo-aponeurotic wall may be performed, and it is a useful procedure during abdominoplasty when patients present diastasis of the rectus abdominis which must be identified preoperatively. Afterward the remaining panniculus is pulled upper and downward to be sutured to the inferior and superior border of the raw area. The first level of suture is the fascia superficialis in order to approximate the border of the upper flap to the lower border, which is the suprapubic margin. Following the closure the subdermal and dermis are stitched. The final scars are smooth and naturally located on the suprapubic area and on submammary sulcus. Adhesive tapes are applied on the surgical scars without any traction. A garment is used covering the whole area of the torso and the abdominal wall which is maintained during 1 week. At this time patient comes to the office to remove the previous dressing and new adhesive tapes are applied. This kind of bandaging is changed once every 10–15 days during 2 months.